When you plan on selling your game with the blurb “Two Whole Players!” ask yourself why you couldn’t think of anything more exciting to say. As a kid born in the early 1980s, I remember…well, not much. But how could I forget such wonderful programming for kids, such as Chip ‘n Dale Rescue Rangers, Duck Tales, Garfield and Friends, Thunder Cats, Smurfs and Gummi Bears. Of course, I didn’t get my first game console until the early nineties, so the kids five to ten years older than me–those playing Atari 2600 as their first console–must have had a different taste in television than I did. And if video game adaptations give any indication, then I can assume that 10-year-olds watched M*A*S*H. After all, what third-grade student wouldn’t appreciate dark comedy and biting satire about Vietnam, cleverly disguised as the Korean War, which itself bears a striking resemblance to the hills of southern California? 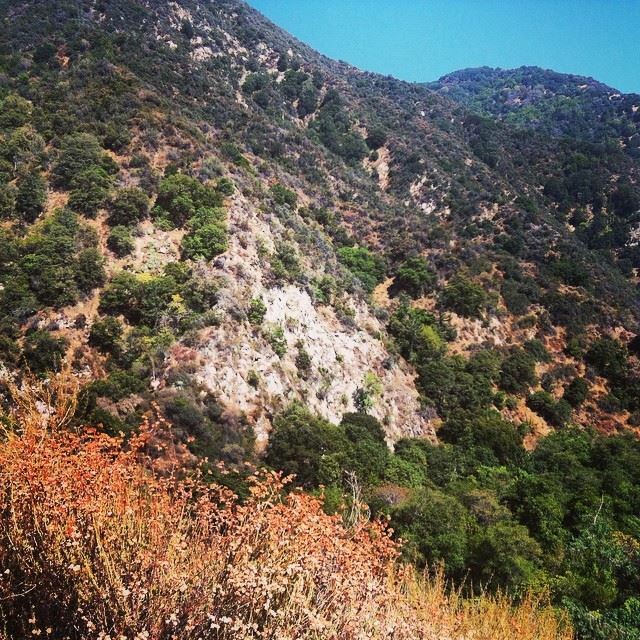 I find it amazing how a country eleven time zones away bears such a striking resemblence to Southern California! We have so much in common! Actually, I love M*A*S*H. My parents have a picture of me in 1984 in my infant carrier, staring down Colonel Flagg. I played Trapper John in my high school’s theatrical production. I’m the only person I know who has watched every episode while actually in Korea. M*A*S*H presents us with an idealistic fantasy world, where bad things might happen, but the antisocial nutjobs always get a pile of garbage dumped on them in the end, the villains act like spoiled children / Tea Party patriots for easy identification, and hero doctors always grow a foot taller than common enlisted men. Why wouldn’t the youth of the eighties (or maybe Fox meant “youth in their eighties?) want to put themselves in the role of the legendary wise-cracking meatball surgeon? Coming from the studio that once tried to turn Family Guy into an MMORPG, I think Fox has long had a problem understanding humor, specifically in how they can translate it into video game format, or in Fox’s terms, milking it for profit. See, the M*A*S*H tv show depended on witty responses to situations, satire on right-wing politics and war, and Catch-22-style double talk. 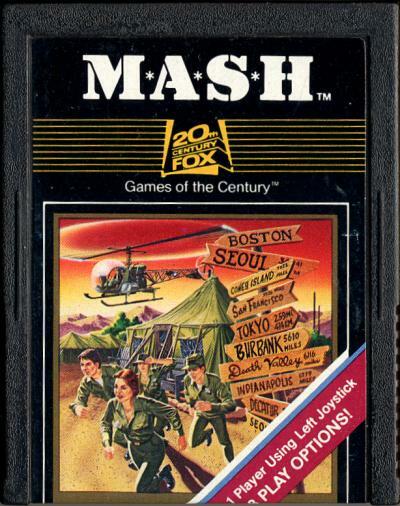 The M*A*S*H Atari game did make me laugh, but more so at the premise that I need to catch Colonel Potter’s skydiving medics because they developed a fondness for leaping from their plane without parachutes. I like to point out the absurdity in games whenever I can, but sometimes they make it difficult, and I just don’t know if I can out-mock a game that asks me to accept that a platoon of soldiers devoted to saving lives has less survival instinct than the entire series of Lemmings games. At that point, the game mocks itself. 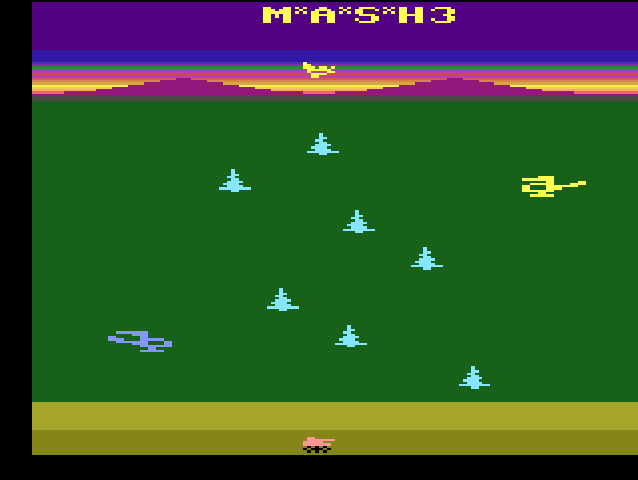 M*A*S*H offers four types of gameplay, with one- and two-player modes for each. 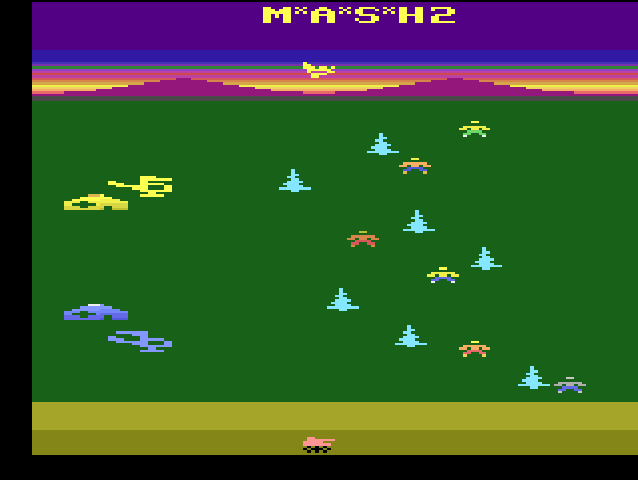 In Modes 1 and 2, the player controls a helicopter, supposedly piloted by Hawkeye, picks up wounded soldiers, while flying low to avoid the lone North Korean tank. Thank you Fox! As embodied by your news network, you strive to offer us as many unintentional jokes as possible! For instance, “Putting a surgeon to work piloting a helicopter instead of a hospital shows that Fox objected to poor people receiving healthcare long before Obama.” Nah, even I didn’t like that one. How about “Military powerhouse North Korea sends one tank after enemy”? No, that didn’t work either. I know! I enjoy the wisdom of piloting a helicopter below the tree line to avoid enemy fire. At least, the idea of a chopper coming at me through the woods, hacking off branches and the heads of small animals sounds like solid, life-saving logic to me. Excuse me, but if you have nothing more than a flap of arm pit skin connecting your upper torso to the rest of your body, I think the doctors should probably move on to someone a little less wounded. Periodically, the game stops to consider that doctors might serve their purpose better in the operating room, and so the scene shifts abruptly to the operating room. Wait, sorry, strike that…the scene shifts abruptly to the Milton Bradley “Operation” game. Surgery consists of removing a small dot–shrapnel, I assume–from a soldier with a physique to suggest that the army put him on the battlefield for the sole purpose of shielding others from bullets using his weeble-shaped hips (although with a body like that, how they got him to lay down on the table without immediately popping upright blows my mind). The player has a fondue fork, with which he must navigate the shrapnel through the soldiers’ bodies without touching the sides of hollow, maze-like tunnels whose presence, I would think, should cause slightly more concern than the dots within them. The player has about fifteen seconds to operate on as many patients as possible, unless you hit the sides, which prompts the game to call you “Ferret Face,” which wins an award for the only thing in the game actually referring to the TV show, despite targeting the wrong character, and sends you right back out to wreak havoc on the trees of South Korea. In mere seconds, the bodies of trained medics will rain from the sky. Some may even impale themselves on those trees. Others, hacked by chopper blades. Too bad none will survive to tend to the wounded. Modes 3 and 4 pits Hawkeye’s helicopter against Colonel Potter’s madness (General Steele, anyone?). Bodies pour out of a plane like a fire hose and you get more points for picking them up just before they hit the ground than if you catch them right out of the plane. Apparently the army gets by on “thrilling climactic rescues” rather than “intelligent strategies.” Modes 5 and 6 work like easy versions of Modes 1 and 2, giving you a smaller helicopter–to shred denser forests, obviously–and a visual cue as to when you’ve loaded the maximum number of wounded on your ship. Modes 7 and 8 put you in the operating room for the entire game, sticking fondue forks into strings of pear-shaped personnel with no daring-yet-suicidal piloting skills required. The player wins the game by reaching 1000 points before their opponent. The score counter only goes up to 999, though, so this may function less as an objective and more as a game-ending technical limitation. But as we learned from Fox News, the multi-conglomerate right-wing organization often views pushing a system until it breaks as synonymous with success, so I guess that makes sense. Presumably, the game pits one player against either the computer AI, presumably Frank Burns, or another player, B.J. Hunnicut or Trapper John. The game ends when one player reaches 1000 points. And it doesn’t take long. “I’ll play the game while watching my M*A*S*H DVDs!” I thought. “I’ll enjoy it!” The resonance of M*A*S*H will combine into an olive drab wave of comedy! Well, as it turns out, not only can you beat all four different game modes within the length of a single episode of the TV show, you can master the game before the second commercial break.